On August 4, the U.S. Appeals Court for the 10th Circuit shot down the Sierra Club’s petition for rehearing motion for the southern leg of TransCanada’sKeystone XL tar sands export pipeline. The decision effectively writes the final chapter of a years-long legal battle in federal courts. But one of the three judges who made the ruling, Bobby Ray Baldock — a Ronald Reagan nominee — has tens of thousands of dollars invested in royalties for oil companies with a major stake in tar sands production in Alberta. And his fellow Reagan nominee in the Western District of Oklahoma predecessor case,David Russell, also has skin in the oil investments game. The disclosures raise questions concerning legal objectivity, or potential lack thereof, for the Judges. They also raise questions about whether these Judges — privy to sensitive and often confidential legal details about oil companies involved in lawsuits in a Court located in the heart and soul of oil country — overstepped ethical bounds. These findings from a DeSmog investigation precede President Barack Obama’s expected imminent decision on the northern, border-crossing leg of Keystone XL. Among the companies listed on Judge Baldock’s financial disclosure located on Judicial Watch’s website for the 2012 reporting year — the year Sierra Club filed its lawsuit — are some with a financial stake in tar sands production. They include ExxonMobil subsidiary XTO Energy, BP, ConocoPhillips, Sunoco and Kinder Morgan subsidiary El Paso Production. The “j” on the forms means a value of $15,000 or less, while “k” means $15,000-$50,000. Russell’s investment portfolio for the 2011 reporting year also included tar sands-related investments in companies ranging from Continental Resources, Plains All American and ONEOK Partners. Appeals Court Judge Robert E. Bacharach — a President Obama appointeee in 2012 — also has his 2012 financial disclosure report online courtesy of Judicial Watch, showing he has no investments tied to the Alberta tar sands. Judge Carolyn B. McHugh, a 2013 Obama appointee, has no forms online to date. A review of Baldock’s forms available on Judicial Watch’s website dating back to 2003 show that starting in 2005, Baldock began investing in all of the same oil companies he has investments in now. Russell had investments in Continental dating back to 2003 and held onto dividends for almost a decade. Neither Baldock nor Russell responded to a request for comment sent by DeSmog about whether they dropped their industry-related investments post-2012. Financial disclosure reports from 2012 for the three judges who decided the 10th Circuit Court’s portion of the case in October 2013 denying Sierra Club the injunction it requested to get TransCanada to stop builidng Keystone XL South show no oil or gas industry investments. DeSmog has submitted a request for financial disclosure reports for all seven of the judges who issued rulings for KeystoneXL South for both 2013 and 2014. Continental Resources at one point signed a deal with TransCanada to carry 35,000 barrels per day of oil obtained viahydraulic fracturing (“fracking”) from North Dakota’s Bakken Shale to market as an appendage of Keystone XL called theBakken Marketlink. Harold Hamm, CEO of Continental Resources and energy advisor for 2012 Republican Party presidential nominee Mitt Romney, set up a lobbying group that lobbied for and eventually won the Bakken Marketlink deal called the Domestic Energy Producers Alliance. Bakken Marketlink relies on the northern leg of Keystone XL though, which has yet to open shop, and which Hamm now calls “irrelevant.” Not that he cares either, with 90-percent of his company’s oil now moving by rail. Most pertinent to Judge Russell, Continental made a fat wad of cash from Keystone XL South opening up for business. Indeed, thanks to Keystone XL South (and now Enbridge‘s “Keystone XL Clone”), record amounts of tar sands diluted bitumen (“dilbit”) now flood Gulf coast refineries. “Between 2010 and mid-2012, pipeline shipments out of the Midwest were relatively flat at about 225,000 b/d until the reversal of the [Enbridge, Enterprise Product Partners jointly-owned] Seaway Pipeline, which now transports crude oil from Cushing, Oklahoma, to the Gulf Coast,” explained Commodity Online. 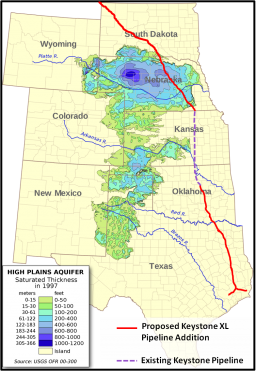 Since then, Seaway has been expanded, and other pipelines, such as TransCanada’s [Keystone XL South], were built to carry crude oil out of the Midwest. By May 2015, pipeline shipments from the Midwest reached 1.3 million b/d, the highest sinceEIA began collecting pipeline shipment data in 1986. ONEOK, which bought Koch Industries’ natural gas liquids unit in July 2005, also has a direct connection with TransCanada. The two companies jointly own the Northern Border Pipeline on a 50-50 basis, a line that brings gas extracted from the “Western Canadian Sedimentary Basin to a growing U.S. Midwest market” according to TransCanada’s website. The tar sands boom in Canada has served as a boon to gas drillers in the Western Canadian Sedimentary Basin, with huge amounts of gas used to extract the tar sands and morph them into dilbit capable of flowing in pipelines. So although Northern Border flows to midwest markets, it still locks in demand for gas drilling, with much of that gas used to enable huge amounts of dilbit to flow through TransCanada’s Keystone Pipeline System. Put another way, Judge Russell found a win-win investment and through his legal decision, helped make his investments more valuable assets. The U.S. Courts seemingly oppose this type of conduct. But as a 2014 investigation published by the Center for Public Intregity explained, it is far from unprecedented, and Judges seldom recuse themselves nor face punishment. For the case itself, Sierra Club attorney Doug Hayes had argued the case should be reheard because of what it argues is the dangerous precedent it would set if the current ruling stood. NEPA, the National Environmental Policy Act, requires that federal agencies allow public comments and public hearings for large-scale energy infrastructure projects as part of their decision-making process. But for Keystone XL South, like Enbridge’sFlanagan South tar sands pipeline and Alberta Clipper (Line 67) project (two pieces of the “Keystone XL Clone”), the Obama Administration allowed these tar sands pipeline companies to dodge the conventional process and get under-the-radar Nationwide 12 Permits instead. Add to this “dire precedent,” then, the fact that at least two of the judges who handled Keystone XL South cases stand to gain financially from the rulings they issued and you have a perfect storm.